The Meat Cleaver dating back to 1830. When Jimmy’s aunt, Cecelia Elder died the family had an auction sale to dispense with the belongings of her estate. That included items that also belonged to her late husband, Fred. The family really didn’t divvy them up, there were so many kids and grandkids and great-grandkids. So the decision was made to have an auction and if you wanted something you had to buy it. That happened to some extent when Jimmy’s mom died. The kids all got something they wanted but then the rest was put up for auction and if you wanted it you had to buy it. Jimmy had been looking forward to the auction. He had bought something from each of his uncle’s auctions and this one was no different. He had probably spent as much time with Uncle Fred as he did with any. He was the closest uncle in distance and one of his dad’s favorite brothers. 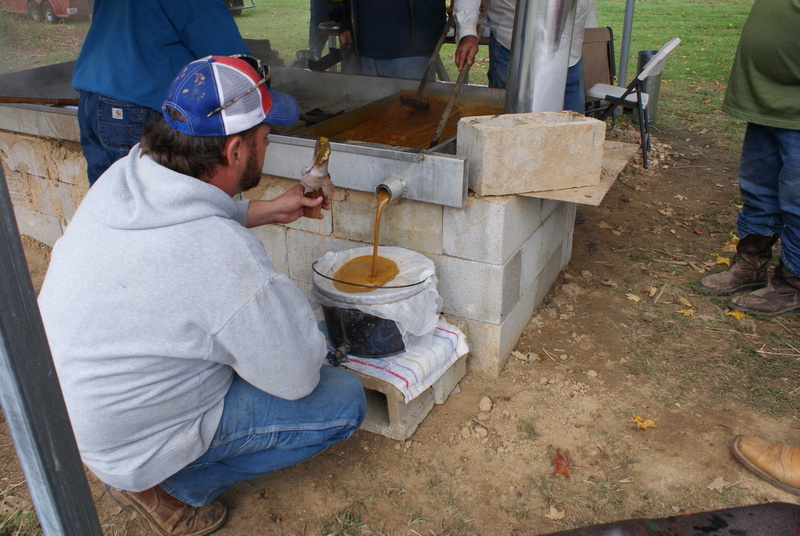 Plus, Uncle Fred grew sorghum and made molasses. Jimmy wanted something from that process. And as the last remaining brother Fred had probably ended up with items from the brothers through the years, especially the ones who had never married. I didn’t go with Jimmy that day. It was a nasty day and I didn’t think it was going to be much of a sale. So I was real surprised when he came home with all of his treasures. He bought a sorghum molasses can. This was an empty can that had never had any molasses in it. It didn’t have a label or any markings on it. It was just a new, empty can. Jimmy wanted it because it was the type of can that Uncle Fred used when he made sorghum molasses. He was very well known for his molasses. Jimmy tells a story, that Uncle Fred used to tell, about the molasses. Uncle Fred’s farm is on Hwy 121 in Graves County. Back before there were interstates this is the highway that anyone would use if they were going through this area into Missouri or Illinois. A lot of people coming in from Tennessee would go this route also. Well, back in that time, when there wasn’t a lot of television, country music singers used to go on the road a lot. They would take short trips into Illinois and Missouri. And to get there they would drive right by Uncle Fred’s place. Year after year Uncle Fred would have the same customers who came through the area stop to get some sorghum. If it was that time of year, they would stop. Porter Waggoner was a famous country singer and he had a band that did road shows. One of his backup singers, and girl singer (as they were called then) was Dolly Parton. Every year Porter Waggoner would drive through this little stretch of Kentucky to get to his shows in Missouri. Every year they would stop at Uncle Fred’s place to get some molasses. Now the way Uncle Fred told it was that Dolly Parton was just a nice looking girl. But over the years she developed into a beautiful, full-figured woman. Uncle Fred always told people that it was his molasses that gave Dolly her curves. That was his claim to fame. Jimmy also bought a suitcase at the auction. It was an old, beat up suitcase. I just looked at him strange. But in this suitcase were parts of the military uniforms that were worn by his uncles during World War II. There were hats and jackets. But the thing that got me was there were these little “Catholic Soldier Kits”. These kits, which were so tiny they could fit easily in any pocket, had a small prayer card, a small relic, and a very small statue of the child Jesus. It was so cool. There were other things in the suitcase as well but those little kits were just precious. There was a beat up Bible in the suitcase too. Years later, we took the suitcase to a family reunion and found out that that Bible had belonged to Jimmy’s cousin who had become a priest. We quickly gave it to him. It had been so beaten up that it didn’t have a cover on it. If we had known it was his we would have given it to him way before that day. There was a hat box that Jimmy bid on. He knew that it contained the hat that Uncle Fred wore to church. He didn’t know if anyone else knew that. He bought it. Then he gave it to his cousin who couldn’t be at the sale that day. He thought the hat should remain with one of the boys, and this one would value it more than most. Uncle Fred loved to collect arrowheads and such. And he had a good collection of those. A lot of people hunt arrowheads in our area. They’ll walk creeks after a big rain to see what they can find. Uncle Fred didn’t have to do much of that. While he was in the field farming it seemed that he always found arrowheads or axe heads or something else. One day Jimmy was out in the field with him and he found this prized arrowhead. It was pretty big and nearly perfect. You can easily find pieces of arrowheads, or small ones, but this one was a pretty good size. Jimmy bought that at the auction. I think it went with a couple of other smaller ones because he brought those home too. He said he had to pay for that one because there were several bidding against him. But the piece that we have come to be most proud of was the meat cleaver. 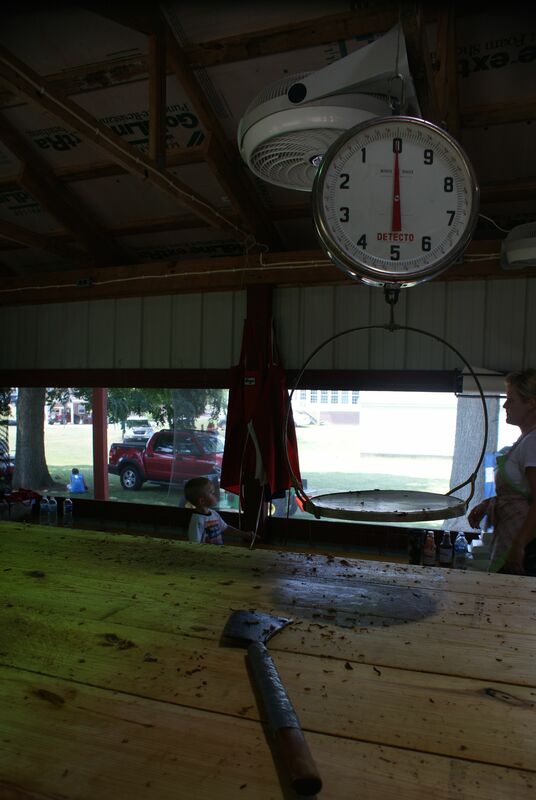 For generations, the Elders have worked the meat stand at the Fancy Farm Picnic. It’s our job. We know it. We know how to do it. 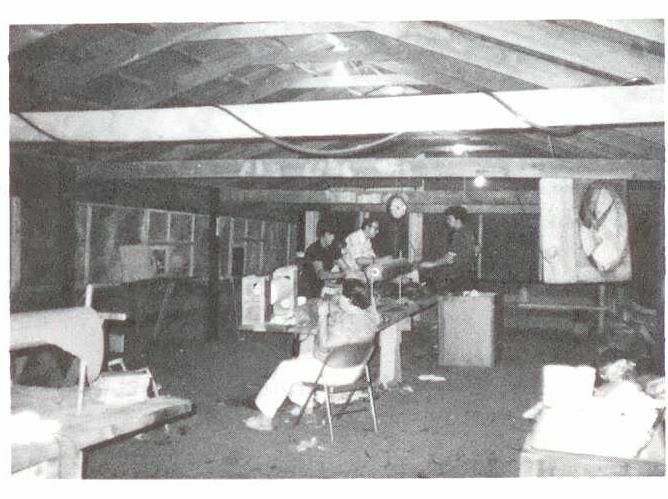 Every year, Picnic week, the men go out to Fancy Farm and clean out the building that will turn into the meat stand. Several years ago the Picnic committee concreted the floor. Before that, the stand was just dirt. 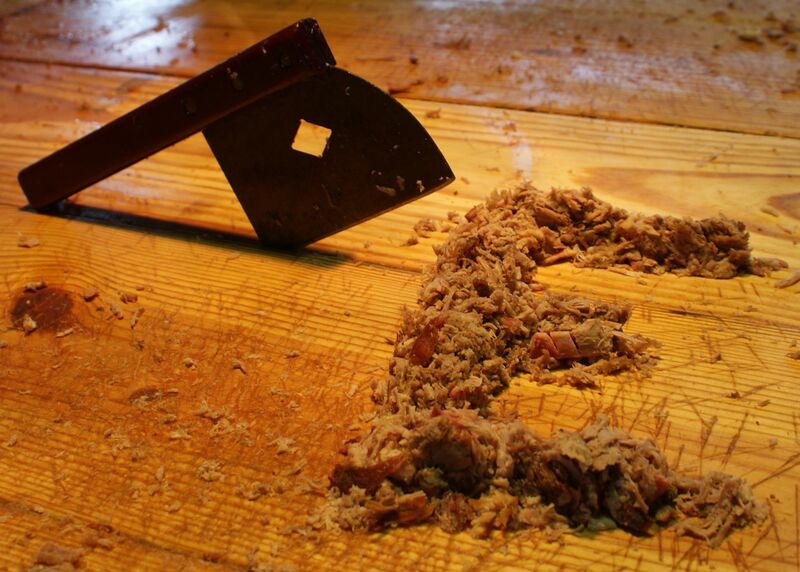 Every year our nephews, now, make the tables where we bone and chop the BBQ pork and mutton that we sell by the pound. But before them their fathers did that work and their fathers before them. Every year we round up the aprons and the knives and the fly spray and have it all ready for when we get out to the Picnic. We collect the aprons over the years and we collect the knives over the years. Some of the aprons mean something, like Danny’s Kroger apron. We hang that one up. No one wears that. But other than that if you want to wear a special apron you had better bring it from home. It’s pretty funny to see a big burley man with a meat cleaver in his hand wearing an apron that says something sissy. But, the knives. 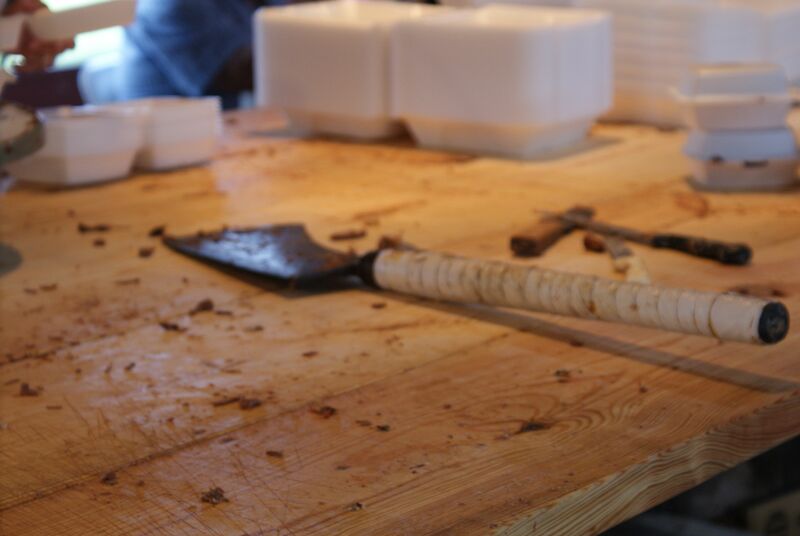 Most of the knives have been around for generations. If you get a good one that makes it easy to dig into a pork shoulder and get those bones out of there then you need to hang onto that all day long. Or if you’re chopping meat you want to make sure you get hold of a cleaver that won’t slip and has a good fit to it. Nothing’s worse than to develop a blister while you’re chopping meat. But years ago, they didn’t bone out the meat. If you wanted a hind quarter of a mutton then that’s what you got. They would chop that off, wrap it up and weigh it for you. That’s just how it was done. When you got home you would bone it out. Through the years it became obvious that people didn’t want it that way so now we bone it out. It’s easier to handle and when you get it home you don’t have to do anything else. I’m sure through the years that people would complain that all they got was bone when they got home. It seems like someone always has to complain about something. But years ago, if you ordered a half of a shoulder, then that’s what you got. They took this huge meat cleaver and chopped that shoulder in half, wrapped it up, weighed it, and sent you on your way. Jimmy remembers his dad using the cleaver, and his Uncle Fred. He didn’t know that Uncle Fred had it. He figured it was at someone’s house but he didn’t know where. When it came up for auction one of his cousins who was there commented that it was Uncle John’s meat cleaver. This was one of Jimmy’s older cousins and he remembered that it was Jimmy’s dad who brought that to the meat stand every year. Jimmy didn’t care. He knew that he wanted it and he was intent on buying it. He figured if he bought it at the sale then it was his, no matter what. So he brought it home. We have a few antiques in our house. In fact, most of the things that are farm related have a place of pride over our kitchen cabinets. That’s sort of our curio cabinet. But all I could think of was “what would happen if that thing fell down off of those cabinets?” It could kill somebody or at least destroy my countertop. Jimmy propped it into a corner next to the refrigerator. I didn’t like that spot much either but it was better than overhead. Later that year, the night before Picnic, Jimmy’s brother Danny died. It was very unexpected and so sad for all of us. We made up our minds that we were going to work in the meat stand anyway. That’s what we did Picnic day and that’s what we were going to do. Actually, we walked around like zombies most of the day but our community had stepped up and we had more than enough help in the meat stand so we could work if we wanted or we could be in shock if we needed. Danny’s son, Matthew worked. He chopped meat like a champ. He thought he was using the cleaver that his dad used but it wasn’t. It was the cleaver that his grandfather and great-uncles had used. It was that big meat cleaver. How that boy handled that cleaver all day long I’ll never know. His dad’s meat cleaver had not made it down to the meat stand before Danny’s death. Danny always brought the cleaver and his Kroger apron with him when he pulled up to the meat stand about 6AM Picnic day. But at the end of the day Matthew took that meat cleaver home with him. Jimmy never said a word to him. He knew that Matthew needed that cleaver a lot more than we did. He figured he would get it later. And he did. The next summer we were at Danny’s house and we asked his widow about the meat cleavers. She said that the one Danny always used was in the basement where he kept it and that the one Matthew brought home from the Picnic was out in the carport, leaning up against the house. That’s where he had left it after Picnic and she didn’t know who it belonged to because it wasn’t Danny’s. Jimmy took both meat cleavers. We used Danny’s at Picnic that year but the big one needed to be cleaned up real good because it had rusted through the year. The next summer Jimmy found somebody who could clean up knives real good. It was an Amish guy who would show up at Trade Day about once a month. Jimmy had checked him out and really liked the work he did. He approached him about cleaning up the knife and the guy agreed. The next month Jimmy took it to him. It took a couple of months before the guy showed up again. When he did he had the cleaver. He asked Jimmy if it was for sale. Jimmy wasn’t mean about it he just said that it wasn’t. The guy then told him he had done a little research on it and found that the cleaver dated back to the 1830’s. And it had the original handle. The cleaver’s handle was wrapped in electrical tape. That kept it from slipping while they were chopping meat. Chopping meat is pretty greasy. The Amish guy didn’t remove the tape but from everything he saw about the cleaver it had the original handle. On the way back to the truck a guy stopped Jimmy and asked if he was interested in selling that cleaver. Jimmy told him no. The guy asked if he could look at it a minute. After he checked it out he told Jimmy that he collected knives and cleavers and such. He had one just like this one but it didn’t have its original handle. This was definitely the original handle and he told Jimmy that it did date back to the 1830’s. The Fancy Farm Picnic is a pretty big deal. We had been contacted by the Southern Food and Beverage Museum about putting a display together at their new museum. It was going to be a permanent display. They were looking for artifacts. Jimmy and I had talked about loaning them the meat cleaver. I will tell you that night, after he told me all about the cleaver, we made the decision that it wasn’t going to leave our house. No way would we even loan it out. I did send them a picture though and they agreed it would not be a good artifact for the museum. They asked for a picture, which we sent, and they were going to attempt to make a 3D copy. That satisfied both of us. So attending family auctions have yielded a lot of treasures, and a lot of history. I don’t know if the Elders were in Fancy Farm yet in the 1830’s. If not that means that they brought this cleaver with them. Either way, sometimes I just sit back and wonder what their life had to be like and how they used tools like this. I am so grateful that I have that history and to be part of this family and this community. You know how you get really excited that Christmas is coming? Or maybe you get really excited the night before you go on vacation. It's all about the anticipation, right? Well, it's no different in Fancy Farm as we prepare to spend the weekend with 10,000 of our closest friends and relatives. We can't wait. The St. Jerome Fancy Farm Picnic weekend starts bright and early tomorrow morning at 7AM. For those of you who don't live here or haven't made it to town yet, you're missing one of the best events of the whole weekend. At 7AM we come together, like the small town of Whoville, to give thanks, to praise, and to pray for the weekend that is upon us. We go to Mass. The Mass is held at the Bingo stand where a little more than 24 hours later people will come from all over the country, and some from all over the world, to try their luck at winning something, anything, at Bingo. And I'm sure sometime during the time that Bingo is played, from 10AM to 10PM there will be someone praying that they win that wagon or that new bike or those St. Louis Cardinals tickets. We come together to do what we do as a community throughout the year and then some. Because we will begin the weekend with Mass, and then we have work to do. Of course, we will attempt to “buy off” Fr. Darrell's prayers straight to heaven that the rain or the humidity or the heat will hold off just for the time when we expect over 10,000 people to visit our humble village and spend a whole lot of money. After Mass, we visit for a minute or two and then we are down the hill, down to the BBQ pits, where the semi truck full of sides of mutton and pork shoulders waits in anticipation for another tradition, the Blessing of the Meat. A lot of people say that the Picnic wouldn't be the same without the politicians but there are those out there who believe that the Picnic wouldn't be the Picnic without the 9500 pounds of pork and 9500 pounds of mutton. So we take the time to bless the meat and our efforts in getting it ready for all of those visitors. And if we have a good year we may be lucky enough to have served up all of that BBQ by the time dinner is finished being served at 7PM. And then we go to work. The Carrico and Hobbs families have all of that meat to put on the pits. Everyone has to make sure that their booths are ready for the next day. Finishing touches will be put on the meat stand by the Elder family. The hamburger stand is ready in anticipation of the crowd that will hit the Picnic grounds on Friday night and Saturday morning. The Knights of Columbus have to get ready for the huge fish dinner they will serve on Friday night. And just because someone is not out on the Picnic grounds doesn't mean they're not getting things ready. There are pies to be baked and last minute dishes being readied for the dinner served beginning at 11AM Saturday morning. But a lot of things are being done in anticipation of family coming to town. Earlier in the week families have travelled to Nashville to pick family members up at the airport. We don't know exactly when those who are driving will be in town, maybe it will be before the One Mile Classic but for sure before the 5K takes off. They are just as excited to get to town. Coming to town Picnic weekend is like coming home for Christmas. Cousins will be able to see each other. Classmates who haven't been home in a year will catch up with each other. Brothers and sisters who live as far away as New York or California make sure they are home for Picnic, as they have done for the last 30, 40 or 50 years. Friday is a time to catch up, make over each other and sit down and play cards to prove that you can still beat them in Pitch/Sell. But everyone knows they can't stay up too late because they have an early day in the morning. And then it comes. At our house we hear the first car go up the road between 5:30 and 6AM. That's our cue to hop out of bed and get going. It would be nice if everyone had that ingrained alarm clock. But we have to bone out BBQ pork and mutton and there will be a line waiting when we get out there at 6AM. Those people in line know that the BBQ doesn't go on sale until 8AM. That doesn't matter. They want to be the first in line. If we started selling the BBQ at 6AM they would be in line at 4. It must be something about the excitement of getting meat right off the pit, the first meat. They want it good and hot. Most of them go home and have a sandwich for breakfast. And that's what we do. We bone meat, chop meat, package meat and sell it until it's all gone. A good year for us is selling out about mid-afternoon. That's a bad year for those who wait to buy their BBQ. They miss out. Of course, we don't want everyone there first thing. But the BBQ keeps coming hot off the pit until it's all sold out so getting it at 8AM or 11AM isn't much difference, unless you believe otherwise. The Picnic officially starts at 10AM. There will be those sitting up at the Bingo stand ready to start playing the minute the clock strikes 10. The funny thing is that there are some who never get up until the clock strikes 10, on the other side. I don't think I could sit that long. But they do, and I have, to some extent because I was bound and determined to win a cooler or a bicycle for a prize. Dinner starts at 11. I cannot even fathom working in the kitchen or the dining room with the endless line of hungry people whose mouths start watering the minute they get out of their car because they can smell that BBQ all over town. And the thing about dinner is that it is “all you can eat”. I am here to tell you that you can eat quite a bit but when you consider the BBQ, the fried chicken, the corn (oh, the corn), the potato salad, the fresh sliced tomatoes, the beans (green, lima or black eyed peas), the slaw, the cucumbers and onions, you can't get it all on your plate. And once you have done that then there are the home made desserts. If anyone leaves the dining room hungry it's their own fault. Don't forget to stop by the Country Store while you're up at the KC Hall. For a solid year the crafty people of Fancy Farm have been making items to sell in the Country Store. There are things for sale in there that you didn't even know that you needed. And if you've got a sweet tooth, and you get there early, there are some home-made bake sale items. If you haven't canned your pickles or jams for the year you can buy some of those too. And even if you choose not to buy one of the beautiful quilts that the ladies of Fancy Farm have made, you have got to go by there and take a look at the craftsmanship of those quilts. If you consider the number of hours and the material in those works of art you will realize that you can walk away with one of the best bargains around. They are a joy to behold. You can buy a chance on one that is raffled and if you're lucky enough they may call your name out at the end of the night to take it home with you. Once back down on the Picnic grounds walk around and spend some money on the booths. The kids save their money to spend on Picnic day. If they're lucky they have an aunt or an uncle who give them money to spend. Most kids were raised around here to work a little extra around the farm or for a neighbor just to make sure they had Picnic money. There are all kinds of games and a great souvenir stand. It's always fun to see what the hot item at the toy booth is. The kids will be running around with their treasures and won't leave their parents alone for one minute until they have the hot item. Oh, and make sure you play the cane stand. Those canes are so popular with young and old alike. In fact, I think it's one of the only places that you can get a cane like that. I have spent many a dollar for one of my kids to win one and have to take it away from them 5 minutes later because they use them like swords and get into sword fights with their friends or cousins. The do come in handy though throughout the year in digging lost socks from behind the dryer. But there's a duck pond, a ping pong game, putt-putt, a bean toss. It's always fun to see if this is a year that they have the dish pitch. You throw a dime into a dish and if you get it in there you get to take that dish home. I always love it when I get all of this mis-matched dishware and the kids throw a fit if I don't want to use it. And then there is the greatest anticipation of all, the political speaking. People watch the first Saturday of August for the entire year in anticipation of who are the serious candidates, what do they have to say, how will the crowd respond, and who's going to mess up. People come from all corners of the country, and sometimes the world for this part of the event. Many of those people don't have a clue that this is just a church picnic. Some of those people are sure that it's a political picnic. Some of those people just know that the event is held on a farm. They don't have a clue that they can have one of the best dinners they'll ever eat. All they know is that their politician, the one that they want to see win, will be there and needs their support. Some of these people travel in chartered busses. They get there in time for the speeches and usually leave not long afterwards. And I'm sure some of those people are so eaten up with politics that they don't see the picnic for what it is. But then there are some who travel down to one of the furthest corners in western Kentucky, year after year. They come to get a BBQ mutton sandwich, to play a little Bingo, to see if they can hob-knob with their favorite politician, and then to experience American politics at its best. Those are the people who get a seat early and make sure that every politician gets a piece of their mind. They are not shy about their opinion of what candidates from either party are saying. They want to make sure they are heard. And that, my friend, is what makes the Picnic at Fancy Farm so unique. I tell people all the time that our Picnic just started as a get together. Most of the residents of Fancy Farm made their living as farmers. This time of the year was when they had all of their crops in the fields but hadn't started harvesting yet. They had some down time. So the members of St. Jerome Catholic Church had a potluck dinner. It was a time to relax and enjoy each others company. Then it turned into a homecoming of sorts. There came a time when children moved off to get a job in the big city. So once a year they would come home. The Picnic was a good time to do that because their brothers and sisters would be home or their cousins or classmates would come to town. Well, back then, when you had a get together like this, with a little bit of a crowd, the politicians would come too. They looked for opportunities to meet people and a little crowd would do it. But in 1880 was the first time that the public was invited out to Fancy Farm to join in with dinner and fellowship and some “gander pulling”. I'd love to say that the Picnic grew and grew and grew. And it did. But I'd say it really started to build in the 1930's and 1940's. That's when Happy Chandler and Alben Barkley and others made sure they came to Fancy Farm right before the Kentucky primary. Happy Chandler was the one who made it known that if you wanted to win a state-wide office you had to come to Fancy Farm. Today there are some who discount that. That's fine. There are still many more who believe that it's a political necessity. And when the politicians come, the media comes. When the media comes the crowd comes. The bigger the crowd the more politicians. It's a never-ending cycle. Which is good. It was probably back in the 1980's, when the Picnic celebrated its 100th anniversary that we began to see the size crowds that we have today. And that is very good. After the political speaking a lot of the crowd will disperse. Some of those people have a long ride ahead of them. The next wave of the crowd will come in. These are people from neighboring communities who come to have dinner, play a little Bingo and catch up with their friends. They might head back over to the Speaker's stand when the band starts playing and listen to them for awhile. This is when things begin to wind down. Of course, this is also the time when all of the workers are pretty worn out and really hot and ready for a break. Fortunately, this is also the time that a new crew of workers come in to take over the night time duties. But then the Picnic does start to wind down. The anticipation of the raffle is huge. Every year a new vehicle is raffled off. For $5 you can win a brand new Jeep. Every young man and young woman is waiting with baited breath to see if it's their name that will be pulled out. Once the name is drawn there is great excitement and great rejection for those who didn't win. Sometimes the winner is there but most of the time the person needs to be called. Sometimes the crowd hangs around to wait on the winner to come and pick up the vehicle but most of the time the crowd leaves before that happens. When we all get home and lay in bed, there is the anticipation of what happens on Sunday. We get out to the grounds early, clean up all of the trash and put everything back to normal. And once that is all done we end the weekend the way we started, with Mass. This picture is of the Pierceall Family of Fancy Farm. Their descendants came to town back in 2013 to do a little research and see where they came from. We were driving into town to go to a little league baseball game. That’s one of the things that we do in late spring and early summer. It doesn’t matter if you know someone playing or not. It’s something to do. And we’re not the only ones. There are people out there, all over out there, watching those kids play. The kids play at all ages. They start at 3 or 4 years old, playing t-ball. They are so much fun to watch. But they are nothing compared to their parents. The parents of a t-ball parent are the funniest thing to watch, period. They try everything in their power to urge their child to pay attention, to run after the ball, to not run after the ball, to throw the ball, to hold the ball. You can tell that they are dying to play for their child. You can also tell the ones who grew up playing ball. They’re helping to coach and they are out there on the field with their child. I mentioned to another parent that when I was growing up, playing ball, they sold beer at the ballpark. Sometimes I think these parents would do well with a beer and just enjoy the game, instead of trying to make their child into the next Babe Ruth. But the ballpark is a huge draw in the spring in small town America. There’s usually a game every night and some nights those games go on way past the little kids’ bedtime. So, the little kids play first and then the older kids get the later games. So if you want a night of entertainment all you have to do is get out there after work and you can stay until it’s past your bedtime. Most of the ballparks in the area have a concession stand. You will hear applause or moans from the parents, depending on how good the concession stand is. The kids don’t care. As long as they can have a gatorade or water during the game and a bag of popcorn and a Sundrop after the game, they don’t care. They are truly in heaven if they get to get a ring pop. It’s the parents who are looking for the best concession stand food. They don’t want to go to that ballpark, they don’t grill. They don’t want to go to that one, they don’t have jalapenos for their nachos. They don’t want to go to that one at all, they don’t have anything. But when all the forces come together, they don’t mind going to that ballpark at all. Nothing is better than a grilled burger with a Sundrop and popcorn afterwards. When you get to the ballpark the first thing is to find out where the team is that you’re going to cheer for. Then you have to find out who you’re going to sit by. Then you go to the concession stand and get that taken care of. Then you get ready for the game. I’ve never been a nice spectator in little league sports. My children have had to endure me. My older children played soccer, not baseball. But I can remember my son, dribbling the ball up the soccer field, me cheering him on, him turning towards me as he went by screaming “shut up, Mom!” I have had to learn to shut up. But in little league baseball, back when my brother played, and my father and I were routinely thrown out of the ballpark, my passion still runs high. Yes, I was thrown out of a number of games. That was because we sat behind homeplate and called every ball. We were fine as long as the umpire called the pitches the way we did. But if he didn’t we had a tendency to get billigerent. It was all in good fun but most of the umpires didn’t see it that way. Well, anyway, that’s one of my favorite stories about my dad. After a year or two of that I was asked to become an umpire. I never hollered at an umpire again. Well, not until an umpire called strike upon strike at my kid who obviously had a better eye than the umpire did. I was fine if some other kid got called out. But I knew what it would do to my kid. So I became a little vocal. Now, my husband has figured this out about me. He has come up with a wonderful diversion for me. He sits me with someone who is not that into the game so that I can sit and gossip. Or he has me stand with him behind the bleachers so I can’t see the game very well and really don’t pay attention until my kid comes up to bat. My kid has learned to hit so if he’s struck out it’s usually because he swings at the ball coming at him. You can’t argue with that kind of strikeout. I will tell you that I’m not the only one like that. I may be the most vocal but I’m not the worst parent out there. But those parents usually have younger kids. By the time the kids get older the parents are worn out with the game and are there to support their kids and to socialize. And for the concession stand. I am fortunate to live in a community that is full of history. Everywhere you look you can put your hands on things that are 200 years old or more. There are many places where we know our great-grandparents and great-great-grandparents lived or farmed. History is everywhere we look. And our community is more than fortunate to have many people who I would consider to be living history. We are fortunate in many families to have four and five generations who get together on a regular basis. Some of the great-grandparents are still very active and “still have their mind”. I'm not one of those families. I wish I was. But what I do have is the curiosity so that I can “adopt” some of these great-grandparents and listen to their stories. Or I get to listen to their kids and grandkids to hear their stories. Because they have stories. We lost one of those living historians this week. He wasn't one to boast about his stories but if you got him talking he would tell you stories throughout his life. I was usually on the outskirts of those conversations but I always enjoyed listening to what he had to say. 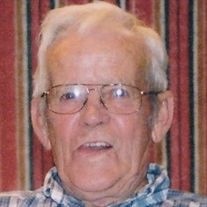 He was a quiet man, always pleasant, and always spoke to you if he knew you. He had a habit of sitting on his front porch, having a smoke, and talking with anyone who came by. There weren't a lot who did but those that did he would appreciate being able to just sit and visit. I became aware of some of his historical stories a couple of years ago. It was around picnic time and there was a camera crew coming in, wanting to get a story on the essence of the picnic. They wanted to know about the politics but more about the history of the politics than anything else. They filmed all around the picnic grounds, talking to everyone who had anything to do with the picnic. They talked with the guys who barbeque the meat. They talked with the organizers of the picnic. They even talked with a couple of politicians. But they wanted more. They wanted to talk with someone who knew more. Jimmy suggested talking with Connie Elliott. He said that Connie knew more about the history of the picnic than anyone else. He had been the political chairman of the picnic for years. He didn't make a big deal about it but he had probably forgotten more about the picnic than most people had ever known. The film crew was thrilled. I didn't go with them to film what he had to say. I had other stuff to do. But I remember when they came back. They talked for a long time how this was the reason they did what they did. They loved hearing the stories from 50 and 60 years ago; stories that so many people had taken for granted that they had all but been forgotten. I can remember being mad that I hadn't gone to listen. I always liked listening to his stories. When the piece came out I was amazed. I couldn't believe just the little bit that they talked about but how he had remembered the story as if it had happened a year or two before. I'm not sure if this story had made the piece or if the film crew had told me about it. 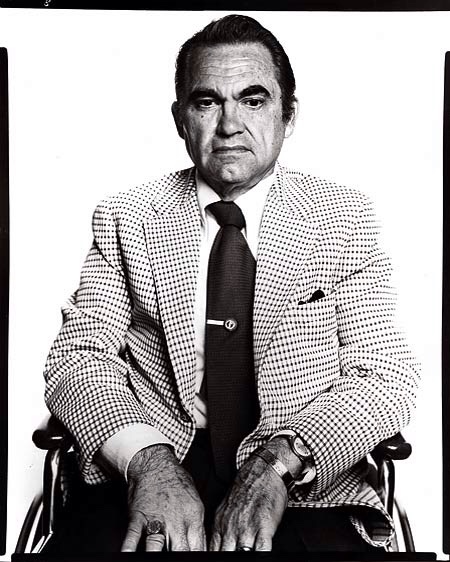 Years ago, when George Wallace was running for President, after he had survived an assassination attempt, he spoke at the Fancy Farm Picnic. Everyone will tell you the story that it was misting that day and there was a photographer who was in the front of the crowd taking pictures. This was back when flash bulbs used to “pop” when they got wet. The flash bulb went off once and Wallace told the crowd that he was a little “gun shy”. After it happened a third time the police removed the photographer. It was either that or Wallace was going to leave the podium. Everyone will tell you that story. But the story that Connie tells was so much better. He told about George Wallace staying at his house overnight. And this is just like Connie. Wallace spent the night on his couch. And Connie didn't get any sleep because the Secret Service agents spent the night walking around outside of the house. They kept waking Connie up. I mean, can you imagine, having a Presidential candidate stay at your house? And sleeping on the couch? And fussing because the Secret Service kept you up? But I'm sure he fed him a big breakfast in the morning and thanked him for coming. That's just the way he was. The film crew told how they could have spent the entire day listening to him. They could have done the entire story on him. And they said how nice and kind and accomodating he was. That doesn't surprise me either. It seems that the people of Fancy Farm are very nice and kind and accomodating; most of the time more than they need to be. We love visitors to our area. We love telling them all about our community. We may not want them to stay but we want them to tell people about their time here and invite them to come back. Connie's not the only one in the area who has a story to tell. There are so many. And so many stories that need to be told. I wish I could sit down with everyone in town and hear their story and write about it. Maybe one day I will. But I think each family has somebody who can listen to the stories and remember them, and maybe sit down and write them down, even if they are just for their family members. There are so many stories worth telling, worth listening to. I hope we don't let one of them be forgotten. I was out shopping one day, minding my own business, when this woman I know came up to me and called me a dirty name. She immediately started laughing. Now, I didn't take offense to this; personally I took it as a compliment. I know others who would have taken offense. But I didn't. But I wasn't going to call her one in return. I had a better compliment for her. I called her a heifer. She immediately started laughing again. She told me that she didn't take offense to it because her daughters-in-law call her that all the time. I told her that if she was going to take that as an insult she needed to learn a few things about cows. I was raised in the city. I can remember my dad calling me “Tubby”. My sister found me this little Precious Moments pig named “Tubby”. She bought it for me. She thought it was so funny. I didn't mind being called Tubby. I sort of had an issue with being compared to a pig. But the little statue was cute. And it reminded me of my dad. So I liked it a lot. But I didn't know a thing about cows. I didn't know anything about heifers. I did know that calling someone a heifer was an insult. But then I moved to a dairy farm. I will tell you that being called a heifer is not an insult. 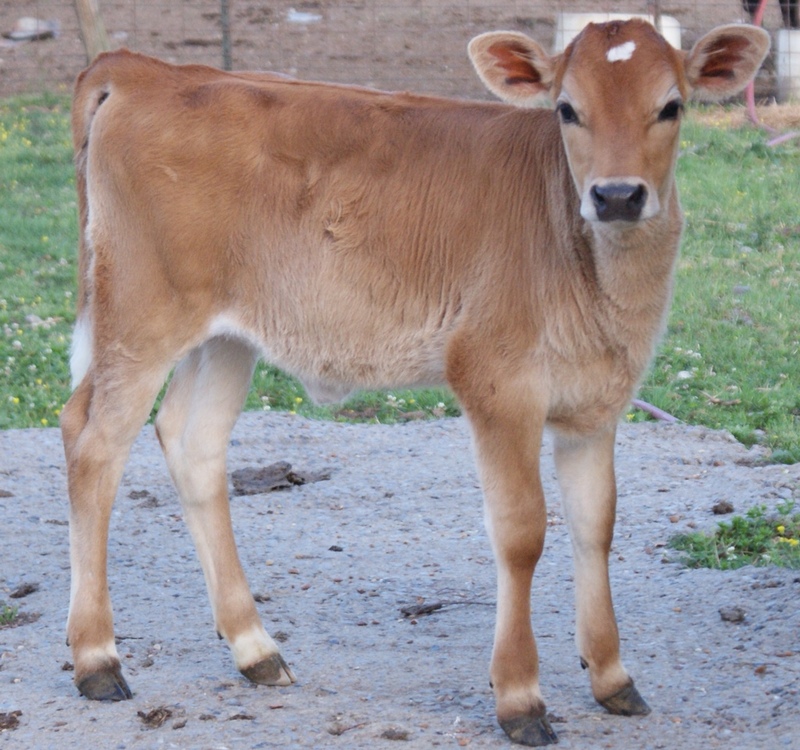 A heifer is a young cow who has had one calf. When the heifer has had her second calf then she turns into a cow. So, being called a heifer is really a compliment. I came to realize that anyone who wanted to call me a heifer was doing me a favor. Because when I moved to the farm I had already had two kids. When I had my youngest daughter I made up my mind that I was going to start over as a heifer. I knew I couldn't but I liked that idea. Because if I didn't remain a heifer I was going to be the aged cow. Jimmy showed cows. They started showing calves when they were 3 months old; Junior calves. They go up to the Aged Cow. The Aged Cow is 5 years old and up. This is a cow who has had 4 calves or more. When I married Jimmy he showed an Aged Cow. She was 6 years old. She put out good calves and gave good milk. The big deal was her udder. She had a great looking udder. One of the problems an aged cow will have is getting an infection and developing mastitis. A lot of times a farmer will sell a cow that has mastitis or has an issue with calving or something like that. With 3 out of 4 of my pregnancies I had problems in carrying my babies and birthing those babies. Jimmy would have sold me off a long time before I became an aged cow. I made sure my friend knew that being called a heifer was a compliment. She should take it as such. Yep, I just came home from fish fry Friday. You’re jealous, right? You should be. I was raised eating fish. As a Catholic, growing up in the 1960’s, you had to eat fish every Friday. Most of the time we ate tuna. We had tuna salad, tuna casserole, sometimes we had salmon patties. Those were always good. Every time we got together at a church picnic or fish fry we ate fish sandwiches. On rye bread. Oh, they were so good. They were a whole lot better than the tuna salad or the tuna casserole or even the salmon patties. Of course, my mother didn’t cook them so of course they were so much better than anything she ever thought of cooking. Of course, we didn’t eat fried foods at home. We were told it was because my dad was diabetic and couldn’t have it but I think it’s because my mother had no clue how to fry anything except an egg in bacon grease. But a fish sandwich on rye was one of the favorite dishes at any event. If you could have meat then a bratwurst on rye was just as good. And being able to drink a beer with them made it all the better. So growing up we knew there was other type of fish but we always ate whitefish. Some people call it cod. But that’s what we had. They don’t eat whitefish in western Kentucky. If you go to fish fry Friday you’re going to be eating catfish. In fact, it’s pretty hard to find anything other than catfish to eat. There are some restaurants in this part of Kentucky that only serve catfish. They don’t serve any meat, any other type of fish, they serve catfish. If you don’t like catfish you don’t need to go eat there. I can remember that I used to go eat, and enjoyed it, but remembered that the only other times I had ever eaten catfish was when we used to go visit my grandmother’s family in Arkansas and they would get the fish out of the Mississippi River and my mom complained that it tasted dirty. Yeah, catfish in western Kentucky today doesn’t taste dirty. Of course in this day and age most tof the catfish we eat is pond-raised catfish. That makes a big difference. I enjoyed the catfish. I didn’t like the white beans or the hush puppies. But my family loved the hush puppies and most places would substitute the white beans for something else. I prefer fried okra. So we would eat it on Fridays, during Lent, and through the year any time we wanted it. And we enjoyed it. But the fish fries are the place that we really enjoy it. A lot of the Catholic churches or the Knights of Columbus organizations would host a fish fry as a fund raiser. It served two purposes: help Catholics to stay away from meat on Fridays during Lent; raise funds for the church or the organization. My family would patronize these fish fries, when we weren’t volunteering at them. And it is really a lot of fun. But the best part is getting to eat all of the fish you can eat. And we would eat fish and fries and slaw and some of the best desserts you can put in your mouth. Oh and don’t forget the pickles and onions and baked potatoes and iced tea. Sometimes somthing so simple has just too many choices. Oh, there are fish fries that do have baked fish and macaroni and cheese. And there is at least one that offers fried chicken. Fried chicken, you ask? They will tell you that some non-Catholics would rather have fried chicken. My question always was “do you ask them if they’re Catholic when they ordered the fish?” Of course not. It’s not their position to police who eats fish and who doesn’t. I just know that I wouldn’t want to be tempted. We did go to a fish fry up in Louisvillle a couple of years ago. Their fish fries are not all you can eat. In fact, they have a huge selection but everything is ala carte. I can appreciate that. But we’re not used to it. But they do have one huge advantage over the fish fries in western Kentucky: beer. Yes, I’m sure they probably make more money on beer during Lent than on fish. And there’s nothing better than a fish sandwich on rye with a glass of beer. Oh, except iced tea. There are those who say that you are really not sacrificing by going to a fish fry during Lent. That’s what it was all about to begin with. But the best part of the fish fries, wherever they are, is an opportunity to spend time socially with people who believe as you do, who enjoy good food and the company of family, friends and neighbors. And if you can invite others into your community so they enjoy your company and your food and get a feel for what your faith is like, then all the better. Of course, if there was beer . . .
Years ago Jimmy got with a couple of buddies and they decided they were going to cure country hams. They each put down two hams. They actually bought a whole hog each, got it processed with the hams, pork chops and sausage. They were so very excited about it. And before they went through the “May sweat” the hams were ruined. I think that maybe one or two survived but the others were ruined. And the problem was that they couldn’t just take those hams and put them in the freezer, they were ruined. So a couple of years later Jimmy cleaned out our smoke house and decided that he was going to put up country hams like his dad used to. He put a couple of hams into the smoke house, cured the way he was raised, and sat back and waited. And those hams were worth the wait. The next year he put down a couple more. In fact, through the years he got so good, and so comfortable with the hams that he put them in the Kentucky State Fair. They were selected in the Top 10 of the state. The first year he put one in the State Fair he asked a friend of mine, Beth, who lives in Louisville, if he could put the ham into her basement after the “May sweat” so it could stay cool until it needed to be delivered to the fairgrounds in August. I’m not sure if he mentioned to her that she needed to take the ham out to the fairgrounds but she did that. The year I took one out there I was ready to kill him because it was a big deal to get it entered into the fair. She was rewarded though when he asked her to go back out to pick it up and he gave it to her. Actually, he gave it to her mom and dad. We went by their house to pick up the ribbon and Mrs. Hammer checked the ham to see how good it was. I thought Jimmy was going to hug her right there. Mrs. Hammer’s dad had worked in the dining room for a railroad line. He used to have to select the country hams, so he would take an ice pick and insert it into the ham so he wouldn’t have to cut into it to see if it was any good. Mrs. Hammer stuck her ice pick into the ham. When she smelled the ice pick she got this huge smile on her face. Jimmy was so proud. But what was so funny was when we left Beth and her Daddy got into the car with that ham and went and got it sliced. They would then ration the ham out so that it would last until they got the next one, the next year. Through the years this was the way that it went. Jimmy got to where he would put up 6 or 8 hams. It seemed that we ate pork chops and sausage for an entire year. There were people who got used to getting hams from Jimmy year after year. Now, don’t get me wrong. We didn’t sell hams. Jimmy’s dad used to sell hams years ago. Then the health department got involved and stopped people from selling hams out of their smoke houses. They all had to be inspected. So, Jimmy’s dad quit selling hams. But he had a couple of customers who said they didn’t want to buy a ham from him anymore, anyway. They wanted him to give them a present of a country ham, at Christmas time. Then they would give him a Christmas present too. So, Jimmy didn’t sell hams. But there were some people who just insisted on giving him a present if he gave them a ham. Jimmy decided to quit taking hams up to the State Fair. He realized that he would never win the Grand Champion ham. Jimmy salt cures his hams. His hams are not round and plump. They are cut long, with the shaft still on them and they’re shriveled up. They smell good though. And they taste great. The hams that win the Grand Champion are sugar cured. The problem with sugar cured hams for a country farmer is that once they’re cured they have to be kept in a cooler. Most farmers don’t have a commercial cooler to keep their hams. Then a couple of years ago we had a really weird winter. Jimmy lost 7 out of 8 hams. Hams have to go down into salt when it’s cold, but not too cold. It can’t be so cold that the hams don’t take salt. Once they’ve been down in the salt for awhile then they’re hung up and smoked. Well, that year the weather just didn’t fall right and the hams didn’t cure correctly and by the time Jimmy knew it they were ruined. Last year the weather didn’t work out right at all. So we didn’t get to put any hams down. We were now out of hams. So this year, instead of buying a bunch of hogs, Jimmy found a place where he could buy just the hams. You see, the hams have to come from the right kind of hogs, and they have to processed the right way. Jimmy’s dad always used a yard hog for his country hams. A yard hog is a hog that has been raised on dirt, not concrete. Years ago that wasn’t hard to find. Nowadays it’s not as easy. And the thing about having a hog processed, it has to be scalded, not skinned. You can’t find anyone who scalds hogs anymore. 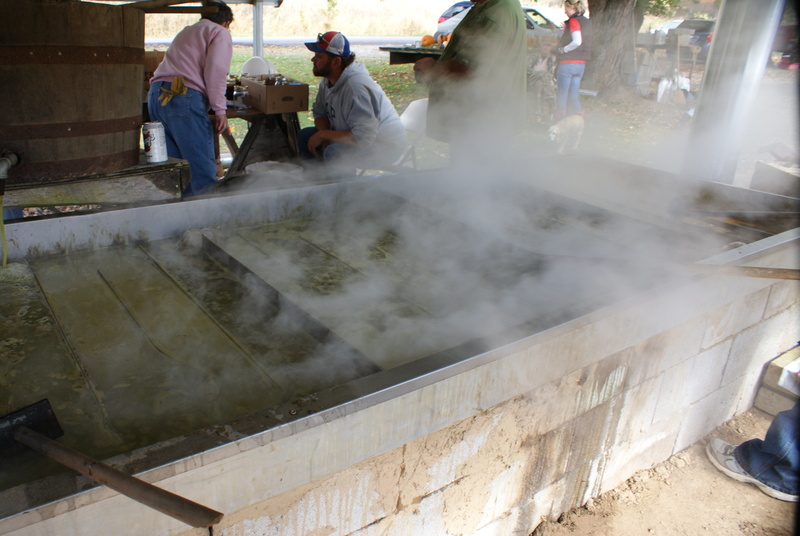 There are some Amish who scald, but not for the public. There are some family processors but they just do it for themselves. There are some groups of people out there who are trying to go back to the basics and do things like they were done 100 years ago. But they’re not out there yet. So getting someone to scald the hogs is almost impossible. So Jimmy got the hams and salted them down. Then the weather turned really cold. When they came out of the salt he didn’t want them to freeze. So he put some heat on them before he put any fire under them. He was smoking them for about a week when the weather turned warm. The second day of really nice, warm weather, and the hams began showing signs of being spoiled. They were swelling. That usually means that they are ruined. So, even though Jimmy grew up watching his dad and uncles cure country hams, and even though he’s been successful at curing hams for years, today he said that he probably won’t ever put another one up. It’s too much money, it’s too much time, it’s having to wait too long. I can’t believe we’ll never have the flavor of one of Jimmy’s hams again. Maybe next year I can talk him into trying it just one more time. One of my first outings when I moved to western Kentucky was that I drove up to the lake near Aurora, Kentucky. They had an arts and crafts festival in the fall. One of the exhibits they had was cooking sorghum. I watched for a while. I might have even bought some sorghum. I’m sure I didn’t know what it was. When we were growing up we were never subjected to sorghum molasses. We ate Karo Syrup on our pancakes, when we had pancakes. It was the clear syrup. If we were lucky we got Mrs. Butterworth’s or Aunt Jemimah’s. Most of the time it was Karo Syrup. But I liked the idea of cooking sorghum up in Aurora. 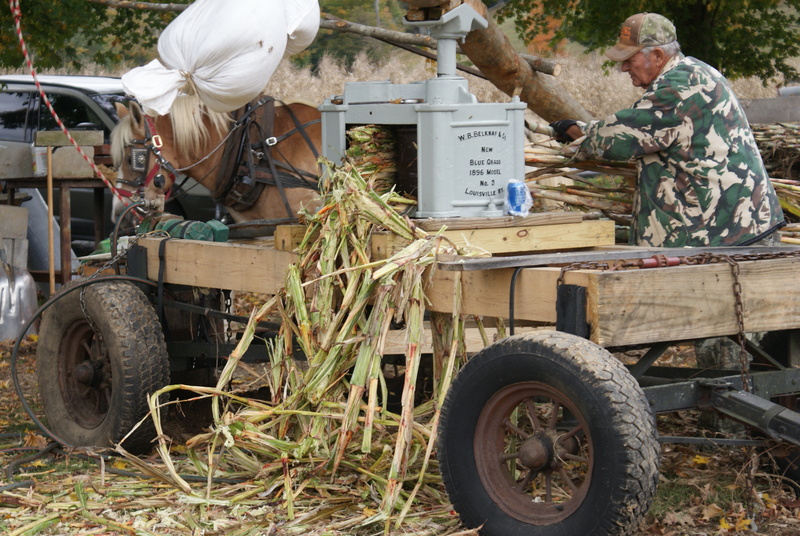 They had horses out there circling a contraption they had set up that squeezed the juices out of the sorghum stalks. 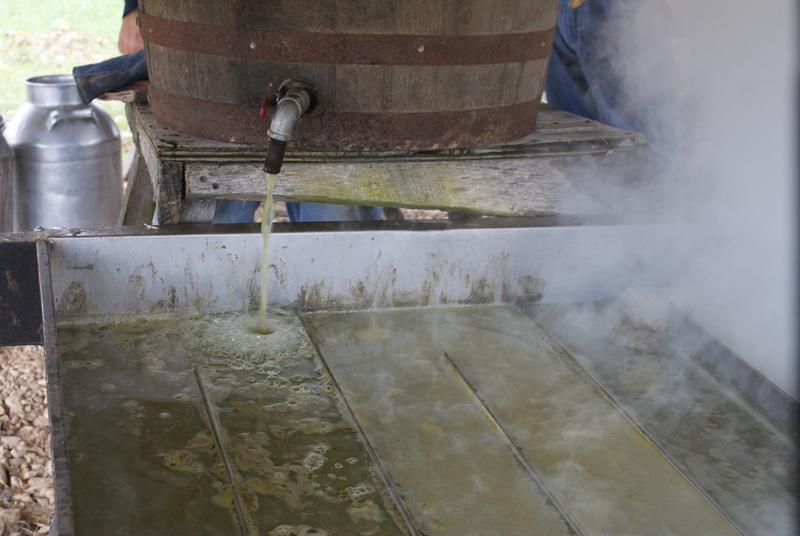 The juice was collected in 5 gallon buckets and when it got close to being full one of the guys would take it and pour it into a tray where it was cooked. 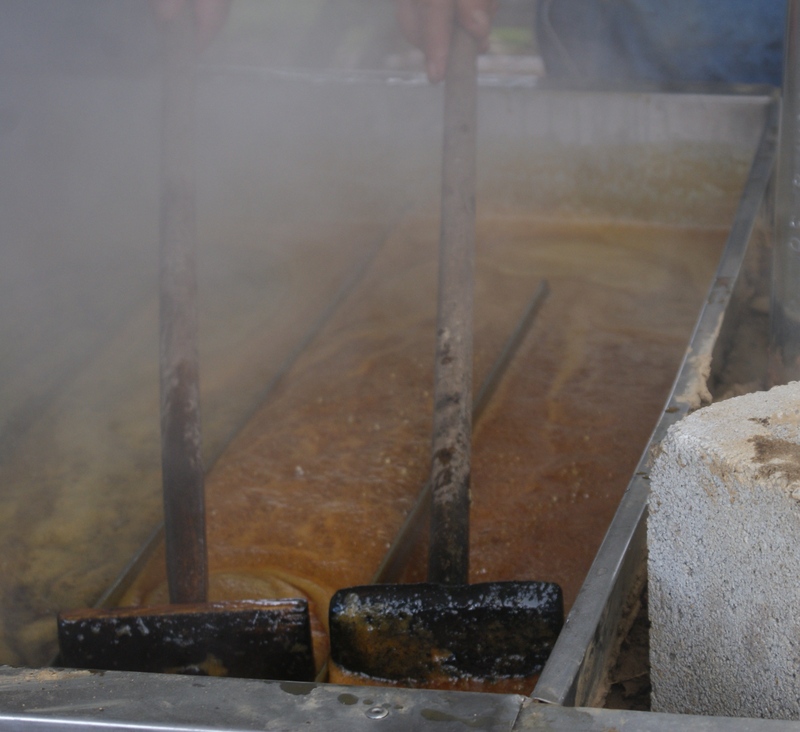 This metal tray was made up of six or eight compartments and the juices started on one end and cooked their way to the other end through a maze of metal. There’s a guy who “stirs” it through. By the time it got to the other end of this tray it was ready to be siphoned out of the tray into another bucket where it would be poured into quart mason jars. 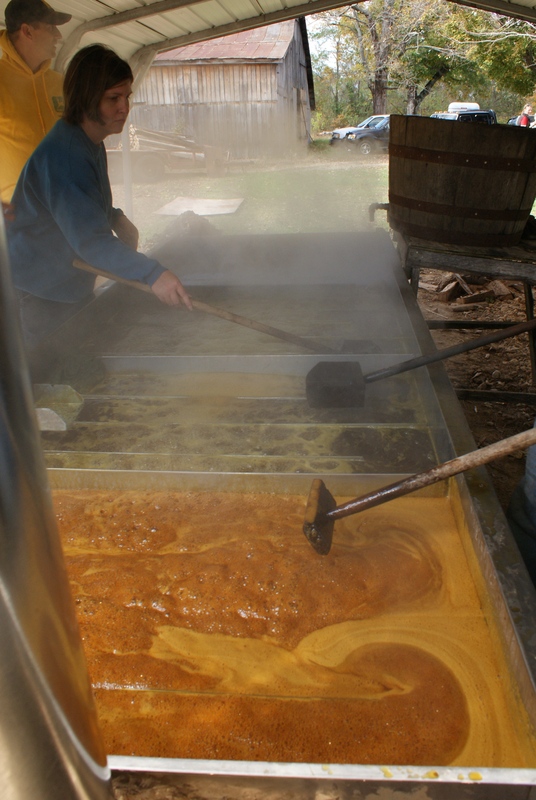 The foam that came off of the molasses was turned into sorghum suckers. I’m sure back years ago they were saved as a treat for the kids. Nowadays I’m sure kids don’t stand in line waiting for them. They’re sweet but really strong. My husband’s family used to grow sorghum. Every fall, after harvest, they would go over to their Uncle Fred’s farm to cook the sorghum. 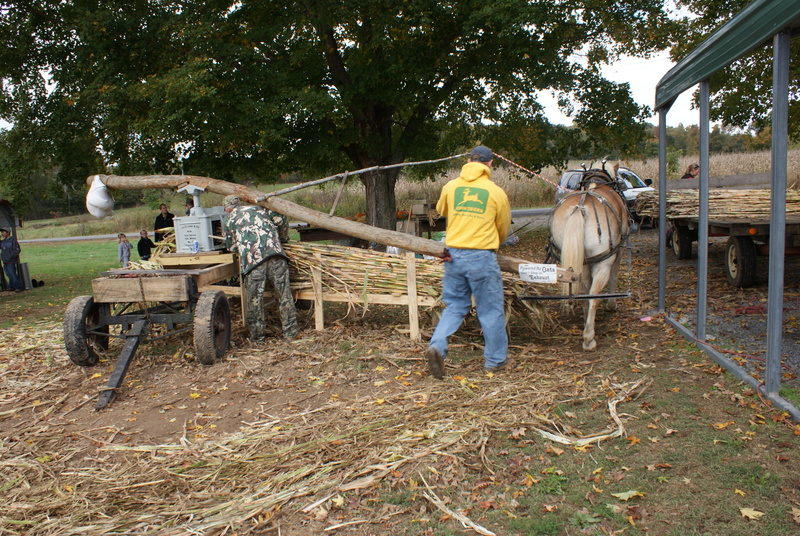 Everyone worked together and they put up a supply of sorghum to get them through the year. Back then they pretty much grew what they ate. Of course, I have heard the stories about how much the kids got to where they hated molasses. They couldn’t wait until it was all gone so that they could go to the store and buy some Karo Syrup. In fact, sometimes they were so sick of it that the only thing that could make it edible was mixing it with peanut butter. To this day my husband puts peanut butter on his pancakes, with his syrup. It doesn’t matter what kind of syrup, he spreads peanut butter first and then pours syrup over that. One of my favorite stories that he tells is about his Uncle Fred and sorghum. Uncle Fred must have been the molasses connosseur. In fact, he would make so much he had some to sell to passers-by. He would put the molasses into tin cans. 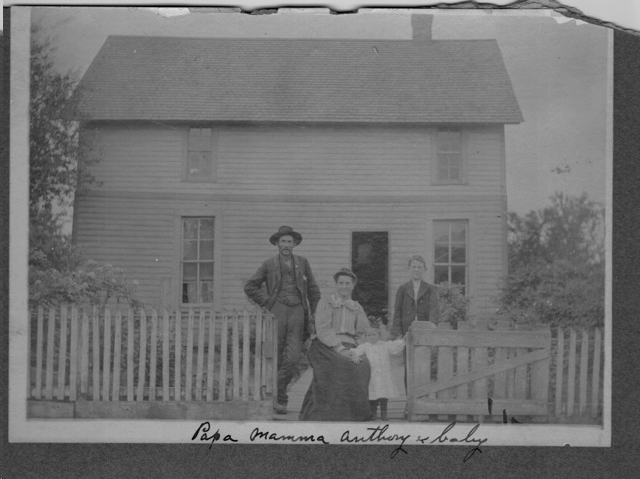 After his wife, Cecelia died, they had a sale of their farm and property. Uncle Fred hadn’t put up molasses in years. Still, they sold some empty tin cans that had never been used that he had saved to put up molasses. Jimmy brought a couple of those home. They are treasures. Anyway, Uncle Fred lived on the main road. In fact, this highway used to be the way that people would travel from Nashville into Missouri and Illinois. Years ago country music shows used to travel by bus out of Nashville into Missouri and Illinois. Porter Waggoner had a bus that used to go on the road, back when Dolly Parton was on the Porter Waggoner Show. They used to stop at Uncle Fred’s and buy sorghum molasses. Uncle Fred used to tell the story that he was partly responsible for Dolly Parton’s curves. I can just imagine him saying that. He was always a quiet guy but I can hear him saying that. Last fall we had to ride over into Trigg County to pick up something. We weren’t lost but we didn’t know where we were. We were relying on the GPS. As we were riding down this quiet country road we noticed some haflinger draft horses geared up. 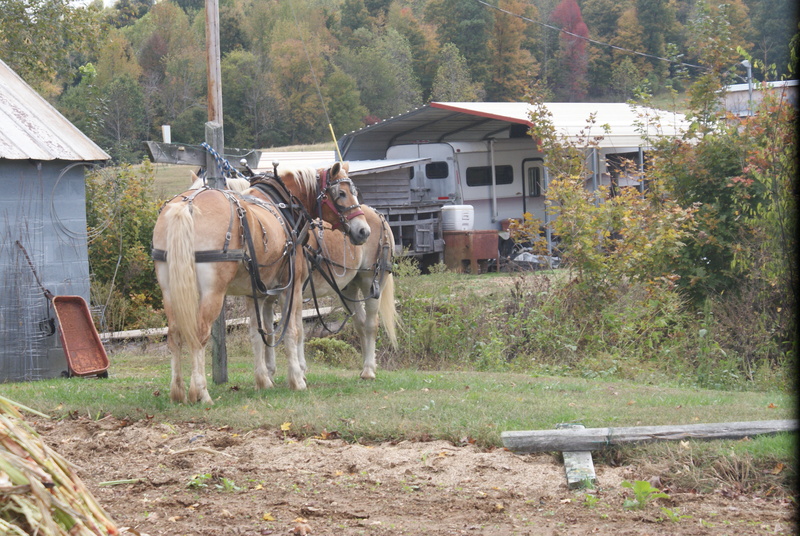 We own haflinger horses so we decided on the way back we would stop and talk with the people about their horses. As we were heading back out to the main highway we slowed down when we saw the horses. I told Jimmy that those people were cooking sorghum. I mean, you would have thought that I was raised in the country. I can’t imagine how I knew that. We stopped. They were indeed cooking sorghum. They raise enough for their family, with a little left over that they share with their neighbors and others in the community. These were the people who used to set up at Aurora trade days, that I had seen when I first moved down into western Kentucky over 20 years ago. They didn’t realize that we knew what they were doing but they were very gracious and let me take pictures and even gave us some molasses to take home with us. They were selling pumpkins so we bought a couple. They also gave us some sorghum that we could use for seed if we decided to put a crop out next year. They offered to cook the sorghum for us if we harvest any next year. You never know what memories are going to surface with a simple drive in the country.